It is indeed a great idea to choose a few souvenirs or gifts for yourself and for your loved ones amid your shopping spree in Ladakh. 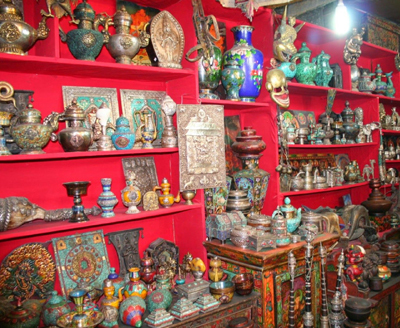 While touring Ladakh, you can shop for curios and mementos in the local markets of the place. The item which is a major draw among tourists is the famous Pashmina shawl. Beautiful stoles and other Pashmina garments are also quite a catch. Some other items like woollen socks, caps, gloves and sweaters, which are hand-woven by the local artisans, woven in wool gathered from Ladakhi goats, and dyed with natural dyes, Ladakhi carpets and rugs are thick, long-lasting and objects of utility and beauty, the carpets have floral or geometric designs or dragon motifs on them and can also be hung as decorative wall hangings, the magnificent Tibetan handicrafts like the Prayer wheels, Thangka paintings and Buddhist masks, the traditional Ladakhi ornaments with turquoise and Tibetan silver jewellery are also admired by the tourists. You may also pick some apricots that are cultivated abundantly in Ladakh which could serve as a tasty souvenir, a gift that you may bring back. While shopping in the local open markets, you may bargain in order to settle the final price of the item. However, the prices are fixed at bigger established stores and in crafts emporia run by Government.